The bid battle for the Singaporean conglomerate ended without fireworks. Even so, the $11.2 bln valuation leaves investors with a 40 pct return over seven months, and loser OUE with a $41 mln break fee. The pressure is now on the victorious Thai bidder to prove the numbers work. Thailand’s third-richest man is set to take control of Fraser and Neave in Southeast Asia’s biggest-ever acquisition after a group led by an Indonesian tycoon bowed out of a two-month bidding war for the Singapore drinks and property company. The group led by Stephen Riady’s Overseas Union Enterprise threw in the towel on Jan. 21 after Thailand’s TCC Assets, headed by billionaire Charoen Sirivadhanabhakdi, raised its offer for F&N to S$9.55 per share. The offer values the company at S$13.75 billion ($11.2 billion). Charoen currently controls 42.5 percent of F&N. 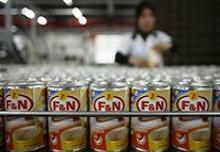 On Jan. 22 F&N shares, which had traded as high as S$9.74 in previous days, fell 2 percent to S$9.55.